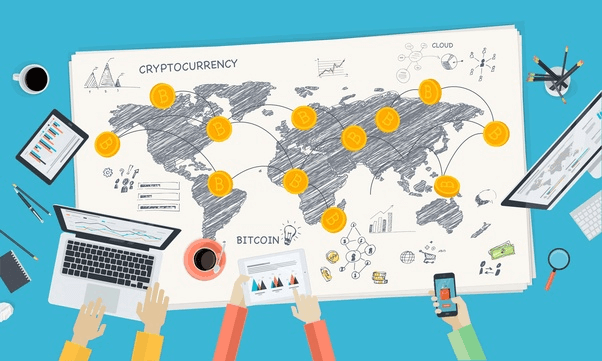 Cryptocurrency is digital money where every individual unit (the equivalent of a cent/dollar) is created as a packet of data secured by cryptographic techniques to regulate the generation of coins (printing money) and verify peer-to-peer transactions. Bitcoin is the first decentralised cryptocurrency in the world. It’s founder, Satoshi Nakamoto, solved the ‘double spending’ problem by using Blockchain technology (public record) to validate each Bitcoin transaction, and here’s the kicker, it doesn’t involve a centralised authority such as a bank. Bitcoin is a cryptocurrency built on Blockchain technology and although there are numerous other cryptocurrencies on the market, for simplicity’s sake and to help you understand what Blockchain and cryptocurrency is, we will focus this article on Bitcoin. Blockchain is a revolutionary technology with the potential for future applications which far exceed Bitcoin alone. From a technical standpoint, it is extremely complicated, but from a layman’s perspective, it is simply a secure book of publicly recorded information. Blockchain is well explained in these two videos. Just like a DNA strand, a single Blockchain is made up of many individual blocks of information (data) linked together. Each block is recorded chronologically from ‘A to B’ ensuring consistency. A block is filled with data that says ‘how much Bitcoin was sent/received’ and ‘who sent/received the Bitcoin’. Every block has a fingerprint that leads to the previous block, all the way back the first block on the chain. and when new information is added to the chain, all the computers on the network cross check each other to create an agreement. Once data has been recorded inside a blockchain, it is extremely difficult to change. This is because, in order for anyone to change it, they would need to control a majority of the computers on the network at the same time, and simultaneously know the fingerprint of each block they want to change. If the data in a block is changed, the fingerprint of the block also changes, and therefore locks access to all the other blocks. As you can see, hacking a Blockchain would be almost impossible. Like Gold, Bitcoin is created through a process called mining. Unlike Gold, Bitcoin miners are people who use high powered computers to help process the encrypted transactions in the Bitcoin network. To process a transaction, a computer must solve an extremely complicated math problem. As reward for solving a certain amount of transactions, miners are rewarded with Bitcoin. After every 210,000 blocks of transactions are processed, the amount of Bitcoin rewarded is halved; this halving takes place roughly every four years. How and why does a crypto currency have value? Many people think that because Bitcoin and cryptocurrency is a digital ‘thing’ that cannot be physically touched, it therefore has no value. However, Bitcoin has value for the same reason any other currency does: because people ‘perceive’ it has value and are willing to use it, in a similar manner to the perception of gold over thousands of years. Just like Gold, Bitcoin has a limited supply. Meaning there will only ever be a certain amount of Bitcoin ever created; 21 million to be exact. Limited supply of a resource drives up it’s demand and value. The Bitcoin blockchain is not created out of thin air. It takes a lot of electricity to drive the computers that create and sustain it. Electricity is a commodity that is bought with money, so the amount required to mine new Bitcoins drives up its price and adds value. As the Bitcoin Blockchain gets bigger, and more miners are added to the network, it becomes more difficult to add to and sustain the chain. The more difficult the Blockchain is, the more it drives competition and value that is added to the Bitcoin price. Bitcoin and cryptocurrencies have advantages for varying people and their different needs. Such utilities include peer-to-peer transactions, meaning two people can send Bitcoin to each other without a 3rd party involved. Peer-to-peer has many advantages, including rate-free international transfers, and making a direct pledge to a charity knowing that all of the Bitcoin is going directly to the intended receiver. Another useful advantage is for people in developing countries or countries with high inflation, who can store their wealth in Bitcoin as an alternative currency that is not subject to the condition of their location. These are just a few of many utilities that Bitcoin and other cryptocurrencies offer, and although they may not apply to you, it hints at their usefulness to many people around the world in major ways, once again increasing its value. Bitcoin and blockchain are innovative technologies which are likely to change the fabric of how we view and use money in the future. Blockchain has the potential to transform big industries in ways we can’t yet imagine: storing medical data, voting from a mobile device, digital security, owning and selling your own internet identity, proof of education, sales transparency in entertainment, property owners rights, and decentralised energy; just to name a few of the 187 things the blockchain is supposed to fix. These potentially potent innovations increase the value of Bitcoin and Blockchain technology. At first, buying and storing Bitcoin can seem complicated, but once you begin to learn about it, it becomes quite simple. Start small while you get to feel comfortable with the process of buying and storing Bitcoin or any other crypto. The most important thing you need to keep in mind is, as there is no bank managing your Bitcoin, you are solely responsible for trading and storing your Bitcoin investment, and like a bank, security should be your number one priority. Before you think about buying your first Bitcoin you need to think about where to store it. The place to store it is in a Bitcoin wallet. There are two different kinds of wallets: hot wallet (software), and cold wallet (hardware). and it is recommended that you purchase a cold wallet before you purchase your first Bitcoin. Now that you have a place to store your crypto, you need to sign up to a Bitcoin exchange that sells Bitcoin. Once you have signed up to an exchange, you will deposit your FIAT money on the exchange to buy your first Bitcoin, where you will find it stored in your account on the exchange. In the exchange, you will enter the unique address of your personal wallet and send your Bitcoin there. Now you are the proud owner of Bitcoin! Warning: Exchanges are not secure locations to keep your cryptocurrency for long periods of time. Welcome to the Bitcoin club! And there it is, a basic overview of what is cryptocurrency, Bitcoin and Blockchain technology so you can begin your journey of understanding and using crypto. There is always much more to learn about these technologies as the market continues to evolve, and like any investment, you should do as much research as possible before making the decision that best suits you. Remember that security is always your number one priority, and that taking it slowly and rationally is your best approach. This is an exciting community, and a journey should you wish to embark, toward learning about and investing in the future of innovative technology.